For freak fortress: These bosses are not together, they are individual Discorded Pinkie Rage: Extreme screen blur, similar to derpy's rage Music: *to be decided* Hp: base of 5000, add 250 for every player above 6 Class: Pyro Weapon(s): Lolichop Info: Discorded Pinkie is the closest to pinkamena you can get, but not nearly as bad as the others. Discorded Rarity Rage: Tosses "rocks" at players Music: Art of the dress.. maybe HP: 10000, +450 per player after 6 Class: soldier Weapon(s): Pickaxe, "Rocklauncher" (Blackbox) Info: The strongest of the group, rarity is a test to see how good you can be against tons of rocks. Discorded Applejack Rage: Knocks player away from hale, gains speed for a few seconds Music: *unknown* HP: 7500 +100 per player above 6 Class: Heavy Weapon(s): Bear claws, "Seismic slam" (KBG) Info: the slowest of the group, applejack hits pretty hard, so try getting her from a long range. Discorded Fluttershy Rage: High melee speed, Spawns a minion (appears to be angel) Minion: Scouts with winger and sandman Minion HP: 200 Hale HP: 4000 + 300 per player above 6 Class: medic Weapon(s): Vitasaw, Quickfix Info: A weak but quick boss, flutters is a easy takedown. 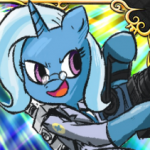 Discorded Rainbow Dash Rage: Turns on friendly fire, much like discords rage HP: 5000 (no buffs) Class: Scout Weapon(s): Winger, Soda Popper Info: she can't fly very well, but she's fast Discorded Twilight Rage: Causes all players to be "turned to stone" (Stunned with a stone visual) HP: 9000 +200 per player above 6 Class: engi Weapon(s): Wrench, Widowmaker Info: she's a medusa in disguise, beware of Twilight!